This season, the New York Philharmonic, led by their new Music Director Jaap van Zweden, examines New York City's roots as a destination of immigrants during New York Stories: Threads of Our City. The centerpiece for the season is the world premiere, January 24–26, of Julia Wolfe’s Fire in my mouth, commissioned by the orchestra, Cal Performances at the University of California, Berkeley; the Krannert Center at the University of Illinois Urbana-Champaign, and the University Musical Society at the University of Michigan, Ann Arbor. Wolfe's music focuses on the garment industry in New York City at the turn of the century — specifically the 1911 Triangle Shirtwaist Factory fire, which killed 146 garment workers, most of them young, female immigrants. The immersive, multimedia performance features the Philharmonic debut of the 36 women of the chamber choir The Crossing, directed by Donald Nally, as well as the Philharmonic debut of Jeff Sugg as scenic, lighting, video, and projection designer. Wolfe has previously explored American labor history with Steel Hammer, her reimagining of the John Henry legend, and Anthracite Fields, an oratorio about Pennsylvania coal miners. Anthracite Fields was presented by the Philharmonic and won the 2015 Pulitzer Prize for Music, while the recording with the Bang on a Can All Stars and the Choir of Trinity Wall Street was nominated for a 2016 Grammy Award for Best Contemporary Classical Composition. Wolfe was awarded a MacArthur fellowship in 2016. The title of Wolfe's new work comes from labor activist Clara Lemlich Shavelson, who, when looking back on her radical youth said, “Ah, then I had fire in my mouth,” though the titular fire also refers to the Triangle Shirtwaist Factory fire. Wolfe is using her signature intensive research methods, drawing on oral histories, speeches, interviews, and historical writings. The music will capture the roar of hundreds of sewing machines and the language of protest to recreate the world of women working in New York garment factories in the early 20th century. Throughout the current season, Wolfe has workshopped Fire in my mouth with the Philharmonic's three commissioning partners. Campus-wide discussions about history, music, and creative writing have been an important part of Wolfe's writing process. Wolfe's previous works on labor history have had extended lives beyond the premieres, with a Steel Hammer stage show and a performance of Anthracite Fields in coal country. The Steel Hammer stage show, which toured the country in the fall of 2015 before ending at BAM's Next Wave Festival, incorporated the work of four American playwrights into the original art ballad. At the same time, Wolfe took the Bang on a Can All-Stars and the Choir of Trinity Wall Street to Pennsylvania coal country to share Anthracite Fields with the community who inspired her, in a benefit concert for the Anthracite Heritage Museum in Scranton. To date Anthracite Fields has also been performed in Philadelphia, PA; New York, NY; Los Angeles, CA; Berkeley, CA; Champaign-Urbana, IL; Trenton, NJ; Copenhagen, Denmark; Athens, Greece; Amsterdam, the Netherlands; and Prague, the Czech Republic. It will be performed at The Kennedy Center on March 13, 2018, and at Carnegie Hall on December 1, 2018. On January 20, Julia Wolfe joins the U-M Contemporary Directions Ensemble, directed by Oriol Sans, for an evening of conversation and performances of her small ensemble works. This concert is part of a week-long residency by Ms. Wolfe (a U-M alum) to develop Fire in my Mouth, an evening-length orchestral work co-commissioned by UMS with the New York Philharmonic, Cal Performances and the Krannert Center. This event is free and open to the public; no tickets required. From May 10-13, Peak Performances in Montclair, NJ presents cellist Maya Beiser and friends in a new evening-length work by Julia Wolfe called “Spinning”, which celebrates the work once performed by hand by women. Music has long been a vital part of the craft — both as a propelling force and as a distraction. To pay homage to the human dignity of this “women’s work,” Wolfe and Beiser create a sonic universe for three cellos and voice performed by Beiser with Melody Giron and Lavena Johanson featuring multimedia projections imagined by the innovative artist Laurie Olinder. Big Beautiful Dark and Scary is one continuous and compelling swell that lives up to every adjective in the title. Wolfe’s music is constantly pushing forward through waves of tension and tremolo until it finally releases a scant 10 seconds before the end of the piece. [Anthracite Fields] captures not only the sadness of hard lives lost…but also of the sweetness and passion of a way of daily life now also lost. The music compels without overstatement. This is a major, profound work. The special brilliance of 'Steel Hammer' is the way in which the whole exceeds the sum of its parts. As complex and perplexing music...for complex and perplexing times, [Steel Hammer} makes our social concerns no less monumental, just more exciting, which may be the greatest form of activism. LEWISBURG, Pa. — Onstage, a choir intoned the names of coal miners whose deaths and injuries had landed them on the Pennsylvania Mining Accident index more than a century ago. In the lobby, members of the audience — some of whom came on free shuttle buses that picked them up from nearby coal towns — created an index of their own, writing about their mining ancestors in a small leather notebook held open with a coal paperweight. Coal is never far from the surface in northeastern Pennsylvania — as a shared heritage, if not always as actual deposits. So anticipation was already running high last week when the composer Julia Wolfe brought “Anthracite Fields,” her Pulitzer Prize-winning choral work honoring the sacrifices of Pennsylvania coal miners, back to her native state. “It feels to me like kind of a romanticization of coal miners — and that doesn’t feel good,” Ms. Wolfe said of the president’s action before a performance of “Anthracite Fields” on Saturday at Bucknell University here in Lewisburg, a college town nestled between coal regions. Just a short drive away, coal is still in use, with 50-pound bags selling for $8.99 at a gas station in Mount Carmel. Mining remains a point of pride, as a “When Coal Was King” mural in Shamokin attests. But it has also left many scars: from streams that run orange with mine drainage to the almost completely wiped-out community of Centralia, where an underground mine fire has been burning for more than half a century. “Anthracite Fields,” a five-part oratorio with roots in rock, classical chorales and the avant-garde, may look to the past, but it is anything but nostalgic. The opening intonation of the names is a long list, despite the fact that Ms. Wolfe limited herself to miners named John, and only Johns with one-syllable last names. As the residents of Pennsylvania’s coal regions turned out to hear the piece here, many were fiercely proud of their coal roots — but not anxious to see a large-scale return to mining. Another movement, “Flowers,” about the way families used to decorate their homes, was inspired by Ms. Wolfe’s interviews with Barbara Powell, 76, a coal miner’s daughter and granddaughter who grew up in Taylor and who now works in the gift shop of the Pennsylvania Anthracite Heritage Museum in Scranton. After the performance, Robert McCormick, the grandson of a coal miner and a railway worker in Big Mine Run, said that the cavernous low notes of Ms. Wolfe’s opening gave him chills, reminding him of the blackness on their old front porch in the dead of night. He said he didn’t know what to think about the calls to bring back coal, noting that he has a nephew who works as a coal miner, operating machinery on a shift he does alone. Ms. Wolfe, one of the founders of the new-music collective Bang on a Can, has won the Pulitzer, been awarded a MacArthur “genius” grant and appeared (as a wolf, natch) on the PBS cartoon “Arthur.” She plans to continue writing pieces inspired by struggling American industries: Her next piece, commissioned by the New York Philharmonic, will be about the women who worked in New York’s garment industry, including the victims of the Triangle Shirtwaist Factory fire. With “Anthracite Fields” she tapped a vein — not just with critics and prize juries, but also with audiences. Commissioned by the Mendelssohn Club in Philadelphia, it has been performed in Pennsylvania at Wyoming Seminary in Kingston and, earlier last week, at Penn State. It will travel as far afield this year as Trenton, Amsterdam and Athens. Ms. Wolfe said that after every performance of the piece, listeners, some of whom are drawn more by the subject matter than by any curiosity about modern composers, come up to her afterward to tell her about their ties to mining. He was one of the men in the accident index: John Coyle. An earlier version of this article erroneously included one location where Julia Wolfe’s choral work “Anthracite Fields” will be performed. It will be presented in Trenton, Amsterdam and Athens. It will not be a part of the Bang on a Can Marathon at the Brooklyn Museum. A version of this article appears in print on April 5, 2017, on Page C1 of the New York edition with the headline: An Oratorio Resonates in Coal Country. Go to macfound.org for more information. As part of the New York Commissions to honor the New York Philharmonic's 175th season (2016-17) with New York-themed works by New York-based composers who have strong ties to the Philharmonic, Julia Wolfe presents a new evening-length piece for orchestra and women's choir about women in the American work force. The Philharmonic plans to present this piece in 2018-19. Wolfe has previously explored American labor history with Steel Hammer, her reimagining of the John Henry legend, and Anthracite Fields, an oratorio about Pennsylvania coal miners. Anthracite Fields was first presented by the Philharmonic at the NY PHIL BIENNIAL and won the 2015 Pulitzer Prize for Music, while the recording with the Bang on a Can All Stars and the Choir of Trinity Wall Street is currently nominated for a 2016 Grammy Award for Best Contemporary Classical Composition. This spring, violinist Jennifer Koh will premiere a new piece by Wolfe at the second NY PHIL BIENNIAL as part of Koh's Shared Madness program. Following her signature intensive research methods, Wolfe will draw on oral histories, interviews, and historical writings to recreate the world of women working in New York garment factories in the early 20th century. Jeff Sugg's video projection and stage-design will illuminate the premiere. In the next few seasons, as Wolfe gathers information about the events and the characters, she will also lead workshops at the Philharmonic's three commissioning partners: Cal Performances at the University of California, Berkeley; the Krannert Center at the University of Illinois Urbana-Champaign, and the University Musical Society at the University of Michigan, Ann Arbor. Campus-wide discussions about history, music, and creative writing will be an important part of Wolfe's writing process. Her previous works on labor history have had extended lives beyond the premieres, with a Steel Hammer stage show and a performance of Anthracite Fields in coal country. The Steel Hammer stage show, which toured the country this fall before ending at BAM's New Wave Festival, incorporated the work of four American playwrights into the original art ballad and was received as “spectacularly inventive and original music theater,” by the Los Angeles Times. At the same time, Wolfe took the Bang on a Can All-Stars and the Choir of Trinity Wall Street to Pennsylvania coal country to share Anthracite Fields with the community who inspired her, in a benefit concert for the Anthracite Heritage Museum in Scranton. Listen to a Studio 360 interview with Wolfe's about her Pulitzer-winning work. In April, the Bang on a Can All-Stars travel to Europe for a blockbuster set of concerts, including the European premiere of Julia Wolfe's Anthracite Fields and the Dutch premiere of her Steel Hammer. The recording of Anthracite Fields on Cantaloupe Music was nominated for a 2016 Grammy award for Best Contemporary Classical Composition. "My aim with Anthracite Fields is to honor the people who persevered and endured in the Pennsylvania Anthracite coal region during a time when the industry fueled the nation, and to reveal a bit about who we are as American workers." On April 20-21 the All-Stars reunite with the stunning Norwegian singers Trio Mediaeval for the Dutch premiere of Julia Wolfe’s Steel Hammer, performances on April 20 are at Laurenskerk, Rotterdam (presented by De Doelen) and April 21 at the Muziekgebouw aan 't IJ Amsterdam. Steel Hammer is inspired by my love for the legends and music of Appalachia. The text is culled from the over 200 versions of the John Henry ballad. The various versions, based on hearsay, recollection, and tall tales, explore the subject of human vs. machine in this quintessential American legend. Many of the facts are unclear – some say he’s from West Virginia – some say he’s from South Carolina – some say he’s from New Jersey... But regardless of the details, John Henry, wielding a steel hammer, faces the onslaught of the industrial age as his super human strength is challenged in a contest to out dig an engine. I drew upon the extreme variations of the story, fragmenting and weaving the contradictory versions of the ballad that have circulated since the late 1800s in to a new whole - at times meditating on single words or phrases – in order to tell the story of the story - to embody the simultaneous diverse paths it traveled. The sounds of Appalachia have long been a part of my musical consciousness. (My first public music performance was on mountain dulcimer). I have referenced the folk music influence in many of my other works - Four Marys (for string quartet) and Cruel Sister (for string orchestra) take folk tales as the inspiration for the music. LAD (for 9 bagpipes), and Accordion Love (accordion concerto) explore and experiment with folk performance traditions. In Steel Hammer, I’m calling on the Bang on a Can All-Stars to expand out from their usual instrumentation to include the likes of dulcimers and bones, and accessing Trio Mediæval’s extensive work in their native vocal traditions. "[Anthracite Fields] captures not only the sadness of hard lives lost…but also of the sweetness and passion of a way of daily life now also lost. The music compels without overstatement. This is a major, profound work." Click here to read the LA Times review of the concert. Wolfe wrote the work after doing extensive research about the coal-mining industry in an area very near where she grew up in Pennsylvania. Her text draws on oral histories, interviews with miners and their families, speeches, geographic descriptions, children's rhymes, and coal advertisements. The work won the 2015 Pulitzer Prize in music and the recording, on Cantaloupe Music, was nominated for a 2016 Grammy award for Best Contemporary Classical Composition. “Foundation”: The singers chant the names of miners that appeared on a Pennsylvania Mining Accident index 1869-1916. At the center of “Foundation” is text from geological descriptions of coal formation. “Breaker Boys”: Based on local rhymes, this movement also contains the words of Anthony (Shorty) Slick, who worked as a breaker boy. The interview is taken from the documentary film America and Lewis Hine, directed by Nina Rosenblum. Hine worked for the National Child Labor Committee and served as chief photographer for the WPA. “Speech”: The text is adapted from an excerpt of a speech by John L. Lewis, who served as president of the United Mine Workers of America from 1920 to 1960. “Flowers”: “Flowers” was inspired by an interview with Barbara Powell, daughter and granddaughter of miners. In one interview she said, “We all had gardens,” and then she began to list the names of the flowers that illuminated their impoverished homes. “Appliances”: Even today coal is fueling the nation, powering electricity. The closing words of Anthracite Fields are taken from an advertising campaign for the coal-powered railroad. In 1900 Ernest Elmo Calkins created a fictitious character, a New York socialite named Phoebe Snow, who rode the rails to Buffalo. It used to be a dirty business to ride a train. But with the diamond of coal her “gown stayed white from morn till night, on the road to Anthracite,” a stunning contrast to the blackened faces underground. Anthracite Fields was commissioned by the Mendelssohn Club of Philadelphia through Meet the Composer’s Commissioning Music/USA program, which is made possible by generous support from the Mary Flagler Cary Charitable Trust, New York City Department of Cultural Affairs, the William and Flora Hewlett Foundation, and the Helen F. Whitaker Fund. Additional support was made possible through the Mendelssohn Club of Philadelphia Alan Harler New Ventures Fund, The Presser Foundation, The Pew Center for Arts and Heritage, the National Endowment for the Arts, The Musical Fund Society of Philadelphia, and the Aaron Copland Fund for Music. Julia Wolfe's, Anthracite Fields, her Pulitzer prize-winning oratorio for chorus and amplified ensemble, has received a Grammy nomination for Best Contemporary Classical Composition. Click here to listen to an NPR feature on Anthracite Fields. Wolfe wrote the work after doing extensive research about the coal-mining industry in an area very near where she grew up in Pennsylvania. Her text draws on oral histories, interviews with miners and their families, speeches, geographic descriptions, children's rhymes, and coal advertisements. The recording features the Bang on a Can All-Stars and the Choir of Trinity Wall Street, under the direction of Julian Wachner. This spring Anthracite Fields has its West Coast and European premieres. From December 2 through 6, the Brooklyn Academy of Music presents the staged incarnation of Steel Hammer, directed by Anne Bogart with music and lyrics by Julia Wolfe. The work creatively explores the subject of human vs. machine and the cost of hard labor on the human body and soul by distilling the discrepancies of over 200 variants of the classic ballad and legend of John Henry into a theatrical post-minimalist mountain-music hybrid. Playwrights Kia Corthron, Will Power, Carl Hancock Rux, and Regina Taylor provide additional texts for the SITI Company, as three singers (Emily Eagen, Katie Geissinger, and Molly Quinn) and the Bang on a Can All-Stars fortify their amplified edge with banjo, bones, mountain dulcimer, and Appalachian clogging. Steel Hammer is inspired by my love for the legends and music of Appalachia. The text is culled from the over 200 versions of the John Henry ballad. The various versions, based on hearsay, recollection, and tall tales, explore the subject of human vs. machine in this quintessential American legend. Many of the facts are unclear — some say he’s from West Virginia — some say he’s from South Carolina — some say he’s from New Jersey... But regardless of the details, John Henry, wielding a steel hammer, faces the onslaught of the industrial age as his super human strength is challenged in a contest to out dig an engine. I drew upon the extreme variations of the story, fragmenting and weaving the contradictory versions of the ballad that have circulated since the late 1800s in to a new whole — at times meditating on single words or phrases — in order to tell the story of the story — to embody the simultaneous diverse paths it traveled. On November 14, Julia Wolfe returns to the anthracite coal region in Pennsylvania, which inspired her Pulitzer prize-winning oratorio, Anthracite Fields. In order to share the piece with the community that gave her such invaluable assistance in her research, Wolfe will participate in tours of the Lackawanna Coal Mine and give a talk at the Anthracite Heritage Museum in Scranton. That evening, the Bang on a Can All-Stars and the Choir of Trinity Wall Street, conducted by Julian Wachner, will perform Anthracite Fields at the brand-new Allan P. and Marian Sutherland Kirby Center for Creative Arts at the historic Wyoming Seminary in Kingston, PA. The piece is illuminated by the visual projections of scenic designer Jeff Sugg. Proceeds from the concert are to benefit the Anthracite Heritage Museum. Anthracite Fields includes both the dark echoes of the underground caves and the moments of light in the lives of the miners who persevered and endured. The text draws on oral histories, speeches, geographic descriptions, local rhymes, and a coal advertisement. Wolfe also conducted personal interviews, including with a third-generation miner and the daughter and granddaughter of miners, and journeyed into both an active and a closed mine. After a superb premiere at The Krannert Center in Urbana-Champaign, IL, the staging of Julia Wolfe's Steel Hammer by director Anne Bogart and her SITI Company with the Bang on a Can All-Stars goes on tour beginning October 23, with a final performance at the Brooklyn Academy of Music in December! Then On November 14, Julia Wolfe returns to the anthracite coal region in Pennsylvania, which inspired her Pulitzer prize-winning oratorio, Anthracite Fields. In order to share the piece with the community that gave her such invaluable assistance in her research, Wolfe will participate in tours of the Lackawanna Coal Mine and give a talk at the Anthracite Heritage Museum in Scranton. That evening, the Bang on a Can All-Stars and the Choir of Trinity Wall Street, conducted by Julian Wachner, will perform Anthracite Fields at the brand-new Allan P. and Marian Sutherland Kirby Center for Creative Arts at the historic Wyoming Seminary in Kingston, PA. The piece is illuminated by the visual projections of scenic designer Jeff Sugg. Most of my music is about the energy of a group sound — how the interlocking of individuals creates a powerful human expression. Concertos in my mind have meant ''flashy''. I began to think about what could make the experience of the concerto special — how an individual voice could ride the wave of a large ensemble. I thought of the accordion. The accordion is friendly. Who has ever been intimidated by an accordion? It is a unique beast. It has ''lived'' in such great contexts. The accordion's life has been primarily with the people — on the streets, in the wedding hall, and so forth. But one thing is for sure: the accordion is about love. Julia Wolfe's Pulitzer-Prize winning oratorio for chorus and instruments, Anthracite Fields, will be released on Cantaloupe Music on September 25, 2015. Wolfe wrote the piece after doing extensive research about the coal-mining industry in an area very near where she grew up in Pennsylvania. Her text draws on oral histories, interviews with miners and their families, speeches, geographic descriptions, children's rhymes, and coal advertisements. The recording features the Bang on a Can All-Stars and The Choir of Trinity Wall Street, under the direction of Julian Wachner. In returning home and “looking north – the left turn onto route 309, the road-rarely-taken – I delved into a local history,” Wolfe says. With her loving exploration of the place that seemed mysterious to her as a child, she sought to “honor the people who persevered and endured in the Pennsylvania Anthracite coal region during a time when the industry fueled the nation, and to reveal a bit about who we are as American workers.” Listen to a Studio 360 interview about the piece with Wolfe here. The New York Times wrote of the New York premiere of the work, which was a centerpiece of the first NYPHIL BIENNIAL in 2014, “In Ms. Wolfe’s polished and stylistically assured cantata, the overall coherence of the musical material helped her expressions of outrage to burn cleanly and brightly.” This spring Anthracite Fields has its West Coast and European premieres. Julia Wolfe's profound art ballad, Steel Hammer, was not conceived as a stage show, but director Anne Bogart was so inspired by the musical retelling of the John Henry legend that she wanted to give it this dramatic reincarnation with the six-member SITI Company at the University of Illinois (September 26), UCLA (October 23-24), Virginia Tech (November 17), OZ Arts Nashville (November 20-21), and BAM (December 2-6). All of Wolfe's original music will be played by the Bang on a Can All-Stars and singers Emily Eagen, Katie Geissinger, and Molly Quinn, and will include performances on wooden bones and mountain dulcimer, as well as step dancing. The music will be interspersed with texts commissioned from American playwrights Kia Corthron, Will Power, Carl Hancock Rux, and Regina Taylor. Steel Hammer, a Carnegie Hall and Maria and Robert A. Skirnick commission, was a finalist for the 2010 Pulitzer Prize for Music, and the studio recording, featuring the Bang on a Can All-Stars and Trio Mediaeval, was released on Cantaloupe Music in 2014. Read NPR interview with Wolfe here. Read NY Times article about her award here. Julia Wolfe's Anthracite Fields, an oratorio for chorus and instruments, has been awarded the 2015 Pulitzer Prize in Music. Wolfe drew on oral histories, interviews, speeches, geographic descriptions, children’s rhymes, and coal advertisements to create a work that gives an intimate look at a particular slice of American life. Anthracite Fields will be released on Cantaloupe Music this September, in a recording that features the Bang on a Can All-Stars and The Choir of Trinity Wall Street with Julian Wachner conducting. The next performance will be in March 2016 with the Los Angeles Master Chorale. Foundation: The singers chant the names of miners that appeared on a Pennsylvania Mining Accident index 1869-1916. At the center of Foundation is text from geological descriptions of coal formation. Breaker Boys: In the center of this movement are the words of Anthony (Shorty) Slick, who worked as a breaker boy. The interview is taken from the documentary film America and Lewis Hine, directed by Nina Rosenblum. Hine worked for the National Child Labor Committee and served as chief photographer for the WPA. Speech: The text is adapted from an excerpt of a speech by John L. Lewis, who served as president of the United Mine Workers of America. Flowers: Flowers was inspired by an interview with Barbara Powell, daughter and granddaughter of miners. In one interview Barbara said, “We all had gardens,” and then she began to list the names of flowers. Click on the WQXR streaming player to hear a live recording of Steel Hammer with the Bang on a Can All-Stars and vocalists Emily Eagen, Katie Geissinger and Molly Quinn recfrom October 14, 2014 at Brookfield Place's Winter Garden in New York City. This performance was presented in partnership with Arts Brookfield and WNYC's New Sounds Live and hosted by John Schaefer. The evening-length cantata marries American folk harmonies and textures (instruments include a hammer dulcimer, mouth harp and banjo) with driving minimalist rhythms and Wolfe's signature dense compositional style. On September 17, Colin Currie reprises his performance of riSE and fLY at London's Southbank Centre, this time with conductor Ricardo Castro and the Youth Orchestra of Bahia. Inspired by New York City street beats and the rhythms of American work song, Julia Wolfe's riSE and fLY is a dazzling work commissioned by the BBC Concert Orchestra for Colin Currie. Borrowing the title from a chain gang work song, Wolfe's intention is to "take Colin to a new place and to bring something earthy and visceral to the orchestra – to break with formality and get down and dirty." The result is a thrilling evocation of street drummers, accordionists, singers, Chinese stringed erhus and the folk tradition of body percussion that fully encapsulates the festival's title, Metal, Wood and Skin. On May 30 and 31, the NY PHIL Biennial presents the New York premiere of Julia Wolfe's newest work, Anthracite Fields, with the Bang on a Can All-Stars and the Choir of Trinity Wall Street (Julian Wachner, conductor). In the new work, Wolfe draws from oral histories, interviews, speeches, geographic descriptions, local rhymes, and coal advertisements to create a unique oratorio that provides an intimate look at an important slice of American life. I grew up in a small town in Pennsylvania — Montgomeryville. When we first moved there the road was dirt and the woods surrounding the house offered an endless playground of natural forts and ice skating trails. At the end of the long country road you’d reach the highway — route 309. A right turn (which was the way we almost always turned) led to the city, Philadelphia. A left turn on route 309 (which we hardly ever took) lead to coal country, the anthracite field region. I remember hearing the names of the towns, and though my grandmother grew up in Scranton, everything in that direction, north of my small town, seemed like the wild west. Anthracite is the diamond of coal — the purest form. At the turn of the century the anthracite fields of Pennsylvania became the power source for everything from railroads to industry to heating homes. But the life of the miner was difficult and dangerous. I had been immersed in issues of the American worker - composing Steel Hammer, an evening length art-ballad on the legend of John Henry. For Anthracite Fields I went deeper into American labor history — looking at both local and national issues that arose from coal mining. I went down into the coal mines, visited patch towns and the local museums where the life of the miners has been carefully depicted and commemorated. I interviewed retired miners and children of miners who grew up in the patch. The text is culled from oral histories and interviews, local rhymes, a coal advertisement, geological descriptions, a mining accident index, contemporary daily everyday activities that make use of coal power, and an impassioned political speech by John L. Lewis, the head of the United Mine Workers Union. My aim with Anthracite Fields is to honor the people who persevered and endured in the Pennsylvania Anthracite coal region during a time when the industry fueled the nation, and to reveal a bit about who we are as American workers. Anthracite Fields was commissioned by the Mendelssohn Club of Philadelphia through Meet the Composer’s Commissioning Music/USA program, which is made possible by generous support from the Mary Flagler Cary Charitable Trust, New York City Department of Cultural Affairs, the William and Flora Hewlett Foundation, and the Helen F. Whitaker Fund. Additional support was made possible through the Mendelssohn Club of Philadelphia Alan Harler New Ventures Fund; The Presser Foundation; The Pew Center for Arts and Heritage; the National Endowment for the Arts; The Musical Fund Society of Philadelphia; and the Aaron Copland Fund for Music. On Tuesday April 29, Cantaloupe Music releases Julia Wolfe's much-anticipated recording of her evening-length art ballad, Steel Hammer. Inspired by her love for the music and lore of Appalachia, Wolfe based her text for Steel Hammer on over 200 versions of the American legend “John Henry”, which has been recorded by everyone from Johnny Cash to Bruce Springsteen. A runner-up for the 2010 Pulitzer Prize, Steel Hammerfeatures the alternately haunting and playful vocalizations of Norway’s renowned Trio Mediaeval, and stretches the standard instrumentation of the Bang on a Can All-Stars with wooden bones, mountain dulcimer, banjo, clapping, clogging and much more. Steel Hammer is a return to my musical roots in folk music When I wrote the piece, I looked to the breadth of musicianship in the Bang on a Can All-Stars. Trio Mediaeval was also a key inspiration, because they bring a beautiful pure sound and a real depth of emotion to the work. And last but not least, I was moved by the myriad songsters, some known, some not-so-known, who filled my ears with their own personal versions of the John Henry ballad. The text is culled from the over 200 versions of John Henry. The various versions, based on hearsay, recollection, and tall tales, explore the subject of human vs. machine in this quintessential American legend. Many of the facts are unclear — some say he’s from West Virginia, some say he’s from South Carolina, some say he’s from New Jersey — but regardless of the details, John Henry, wielding a steel hammer, faces the onslaught of the industrial age as his super human strength is challenged in a contest to out-dig an engine. I drew upon the extreme variations of the story, fragmenting and weaving the contradictory versions of the ballad that have circulated since the late 1800s into a new whole — at times meditating on single words or phrases in order to tell the story of the story, to embody the simultaneous diverse paths it traveled. Steel Hammer premiered in November 2009 at the University of Florida, and eventually made its way to Carnegie’s Zankel Hall for its New York debut. Writing for the New Yorker, Alex Ross referred to the work as “...a musical archaeology of a familiar tale — one that preserves, even enlarges, its central mystery." 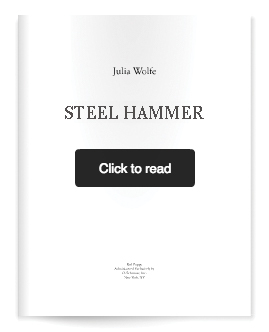 Pre-order Julia Wolfe's Steel Hammer before April 20 and receive advance copies, signed CDs, credit as an Associate Producer (order before February 18), and special hand-drawn score page from Steel Hammer, the hotly anticipated album by Julia Wolfe, featuring the Bang on a Can All-Stars and Trio Mediaeval. Inspired by her love for the music and lore of Appalachia, Julia Wolfe based her text for Steel Hammer (called a “wild hybrid” by the New York Times) on over 200 versions of the John Henry ballad, exploring the subject of human vs. machine in the quintessential American legend. Featuring the haunting—and often haunted—vocalizations of Norway’s Trio Mediaeval, Steel Hammer also stretches the standard instrumentation of the Bang on a Can All-Stars with wooden bones, mountain dulcimer, banjo and more. This season Julia Wolfe's large works for string orchestra, Fuel and Cruel Sister, are performed at Carnegie Hall by two of the country's leading interpretors of contemporary works. On October 25, Robert Spano leads the American Composers Orchestra in their Carnegie performance of Julia Wolfe's full-throttled work for strings, Fuel, on a concert dubbed "Orchestra Underground: Adding Fuel to the Fire". Wolfe's Fuel was created in collaboration with filmmaker Bill Morrison and is inspired by the mystery and economy of how things run — the controversy and necessity of fuel — the global implications, the human need. Premiered in 2007 by Germany's Ensemble Resonanz, Wolfe wanted to capture, in music, the sounds of transport and harbors — New York and Hamburg — large ships, creaking docks, whistling sounds and a relentless energy. Fuel was premiered in a multi-media performance with Morrison's film at the Kaispeicher B Warehouse at the port of Hamburg, Germany. On April 24, as part of Carnegie Hall's series Collected Stories (curated by David Lang), Wolfe's powerful work Cruel Sister is performed by conductor Brad Lubman and his Ensemble Signal. Cruel Sister takes its name from a stirring and fantastic Old English ballad. The tale is of two sisers — one bright as the sun, and the other cold and dark. One day, so that she can have the love of a young man who has come courting, the dark sister pushes the bright sister into the sea. Two minstrels find the dead sister washed up on the shore and shape her breastbone into a fine harp strung with her yellow hair. They come to play at the cold dark sister's wedding. As the sound of the harp reaches the bride's ears, the ballad concludes "and surely now her tears will flow." While my piece references no words and quotes no music from the original tune, it does follow the dramatic arc of the ballad — the music reflecting an argument that builds, a body floating on the sea, the mad harp. On July 27, the Massachussetts Museum of Contemporary Art and Bang on a Can present Julia Wolfe’s mesmerizing evening-length art ballad Steel Hammer as part of the Bang on a Can Summer Festival. Steel Hammer was inspired by my love for the legends and music of Appalachia. The text was culled from the over 200 versions of the John Henry ballad. The various versions, based on hearsay, recollection, and tall tales, explore the subject of human vs. machine in the quintessential American legend. Many of the facts are unclear - some say he's from West Virginia - some say he's from South Carolina - some say he's from New Jersey...But regardless of the details, John Henry, wielding a steel hammer, faces the onslaught of the industrial age as his super human strength is challenged in a contest to out dig an engine. I drew upon the extreme variations of the story, fragmenting and weaving the contradictory versions of the ballad that have circulated since the late 1800s into a new whole - at times meditating on single words or phrases - in order to tell the story of the story - to embody the simultaneous diverse paths it traveled. The Bang on a Can All-Stars add a chorus of instruments including mountain dulcimer, wooden bones, banjo, harmonica, and body percussion. From May 9 through 13, Julia Wolfe's Steel Hammer, her evening-length exploration of the American tale of John Henry, receives several European premieres with the Bang on a Can All-Stars and Trio Mediaeval. From January 29 through February 2 the Aire de Jeu festival at Les Subsistances in Lyon, France — the International Laboratory for artistic creation dedicated to theatre, dance, and contemporary circus — features four works (Dig Deep, Dark Full Ride, Lad and Stronghold) by composer Julia Wolfe choreographed by Arkadi Zaides, Maud Le Pladec, Tania Carvalho and Faustin Linyekula. Drawing inspiration from folk, classical, and rock genres, Julia Wolfe's music brings a modern sensibility to each while simultaneously tearing down the walls between them. A co-founder of the inimitable New York City new-music collective, Bang on a Can, Wolfe's music is distinguished by an intense physicality and a relentless power that pushes performers to extremes and demands attention from the audience. In the words of the Wall Street Journal, Wolfe has "long inhabited a terrain of [her] own, a place where classical forms are recharged by the repetitive patterns of minimalism and the driving energy of rock." Her music has been used by choreographers from independent companies to large national ballets. On October 11 on the Ether Festival at London's Southbank Centre, international percussion super star, Colin Currie (with Keith Lockhart and the BBC Concert Orchestra) premieres Wolfe's newest work for orchestra, riSE and fLY for percussion and orchestra, at the South Bank Centre's Ether Festival in London. Using street percussion (buckets and junk percussion) and Appalachian body percussion, Wolfe weaves the soloist into the quilted texture of the orchestra to create an introspective and breathtaking experience. Perhaps antithetic to most percussion concerti over the past many decades, Wolfe's new work focuses onto the intimacy of the instrument, rather than "..and the kitchen sink." riSe and fLY was inspired by New York City street beats and the rhythm of American work song. In New York there is an amazing array of live street musicians gracing subway platforms and street corners - accordion players, singers, Chinese erhus, and more. But perhaps the most amazing music comes from the street drummers. Banging out grooves on plastic tubs and pots and pans, they speak the rhythm of the city. They make me smile and I am one of their most attentive listeners. When Colin Currie asked for a new work I thought of them. I also thought Colin is amazing. He can do anything. But I don't want to just write him another percussion concerto. I wanted to take him to a new place and to bring something earthy and visceral to the orchestra - to break with formality and get down and dirty. It is urban folk music for the orchestra. riSE and fLY connects to my love of American folk as does much of my recent work including my art ballad, Steel Hammer, telling the story of the story of the John Henry legend. While there is no direct narrative in riSe and fLY it is in a sense its own short history - moving from the American folk tradition of body percussion to the contemporary urban "folk" rhythms of the street. The title, riSe and fLY, is taken from a phrase of a chain gang work song from the collection of Alan Lomax, the great American folksong collector.